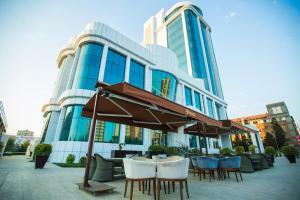 Sumgayıt Plaza Hotel in Sumqayıt has a fitness centre and a terrace. 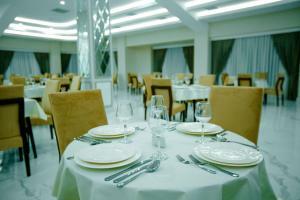 Among the various facilities of this property are a bar and a restaurant. The tour desk can help arrange some activities and free WiFi is provided. At Sumgayıt Plaza Hotel, all rooms have a desk and a flat-screen TV. Sumgayıt Plaza Hotel features certain rooms with sea views, and each room is fitted with a private bathroom. All guest rooms will provide guests with a wardrobe and a kettle. Continental and buffet breakfast options are available each morning at Sumgayıt Plaza Hotel. 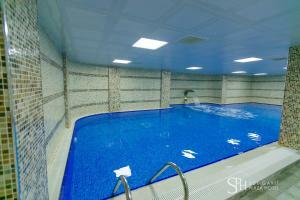 At Sumgayıt Plaza Hotel guests are welcome to take advantage of a sauna and a Turkish bath. Speaking Azerbaijani and English, staff will be happy to provide guests with practical guidance on the area at the 24-hour front desk. Baku is 17.4 miles from Sumgayıt Plaza Hotel.